And You Think Times Are Tough!!! There are some "woo be me" stories doing the rounds since the great "Global Economic Meltdown" started gaining prominence on every news cast but I wonder how bad it really is. I was thinking about my situation when I came across this outline of times in England around about 1500 AD. Most people got married in June because they took their yearly bath in May, and still smelled pretty good by June. However, they were starting to smell, so brides carried a bouquet of flowers to hide the body odour. Hence, the custom today of carrying a bouquet when getting married. Baths consisted of a big tub filled with hot water. The man of the house had the privilege of the nice clean water, then all the other sons and men, then the women and finally the children, last were all the babies. By then the water would have turned so dirty you could actually lose someone in it. Hence the saying, "Don't throw the baby out with the Bath water." 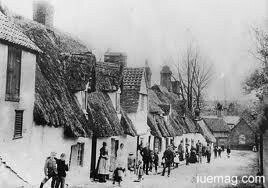 Houses had thatched roofs of thick straw piled high, with no wood underneath. It was the only place for animals to get warm, so all the cats and other small animals (mice, bugs) lived in the roof. When it rained it became slippery and sometimes the animals would slip and fall off the roof. Hence the saying:"It's raining cats and dogs." The floor was dirt. Only the wealthy had something other than dirt. Hence the saying: "Dirt poor." The wealthy had slate floors that would get slippery in the winter when wet, so they spread thresh (straw) on floor to help keep their footing. As the winter wore on, they added more thresh until, when you opened the door, it would all start slipping outside. A piece of wood was placed in the entranceway. Hence the saying "a thresh hold." In those old days, they cooked in the kitchen with a big kettle that always hung over the fire. Every day they lit the fire and added things to the pot. They ate mostly vegetables and did not get much meat. They would eat the stew for dinner, leaving leftovers in the pot to get cold overnight and then start over the next day. Sometimes stew had food in it that had been there for quite a while. Hence the rhyme, "Peas porridge hot, peas porridge cold, peas porridge in the pot nine days old.."
Those with money had plates made of pewter. Food with high acid content caused some of the lead to leak onto the food, causing lead poisoning death. This happened most often with tomatoes. So, for the next 400 years or so, tomatoes were considered poisonous. Bread was divided according to the status. Workers got the burnt bottom of the loaf, the family got the middle, and guests got the top, or the upper crust. Lead cups were used to drink ale or whisky. The combination would sometimes knock the imbibers out for a couple of days. Someone walking along the road would take them for dead and prepare them for burial. They were laid out on the kitchen table for a couple of days and the family would gather around and eat and drink and wait and see if they would wake up. Hence, the custom of holding awake. England is old and small, and the local folks started running out of places to bury people. So they would dig up coffins and would take the bones to a bone-house, and reuse the grave. When reopening these coffins, 1 out of 25 coffins were found to have scratch marks on the inside and they realized they had been burying people alive. So they would tie a string on the wrist of the corpse, lead it through the coffin and up through the ground and tie it to a bell. Someone would have to sit out in the graveyard all night (the graveyard shift) to listen for the bell; thus, someone could be, saved by the bell. And that's the truth... Now, whoever said History was boring! ! ! Did you know it was the accepted practice in Babylon 4,000 years ago that for a month after the wedding, the bride's father would supply his son-in-law with all the mead he could drink. Mead is a honey beer and because their calendar was lunar based, this period was called the honey month, which we know today as the honeymoon.